Fun Fall Activities at Ellms Farm Now Includes the NEW Jump Park! Are you looking for fun fall activities your kids will love? 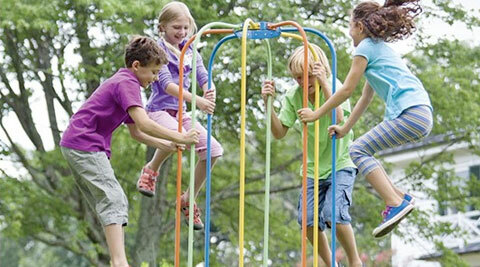 Get your kids to unplug and enjoy the fresh air at our fun jump park. Jumping is a blast with these super-huge, super bouncy inner tube jungle gyms. Kids of all ages will enjoy this activity. It’s like having springs on your feet with a strong handhold to keep jumpers grounded. Be sure to challenge your kids to see how high they can go! Parents, don’t be afraid to channel your inner child and enjoy the jumping fun with your kids! In addition to our Jump Park, our Saratoga County farm features 30+ family-friendly activities. From corn mazes and pumpkin picking to pedal carts, gemstone mining, and a sports zone, our farm has acres of outdoor fun your family can enjoy this fall. No matter what your child’s interests are, they are bound to find something to enjoy at Ellms Family Farm! Click here to get your tickets now.